The NuVision Duo 10 features a 10.1" diagonal, high-definition IPS screen with a 1280 x 800 pixel resolution for an incredibly bright and sharp display. It's powered by and Intel Atom Cherry Trail processor with speeds up to 1.84GHz. Plus, the Duo 10 is equipped with 2GB DDR RAM for snappy application performance and web browsing. This versatile tablet features a 2MP front camera and a 5MP rear camera, allowing you to take vivid, clear pictures and share them on your social network via Wi-Fi. 32GB of storage will hold volumes of your favorite music, videos, and apps. Duo 10 also has an integrated keyboard that connects magnetically to provide easy data entry. Fold the keyboard closed and it serves as a protective cover for your tablet screen. 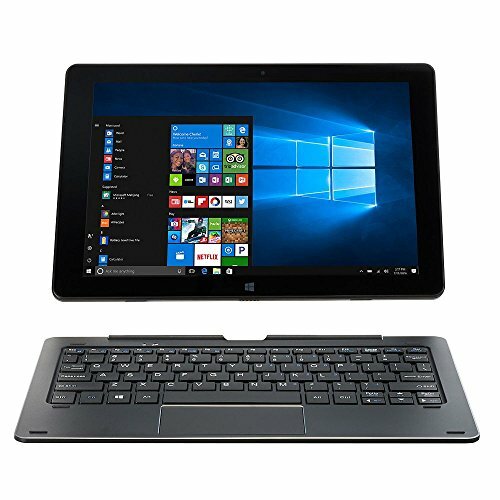 Snap the keyboard off and you have a lightweight, portable tablet.